Spray Foam is available in high density 1.75 to 2.0 lb) for roof repairs, and in standard density (0.75 lb. for inside wall insulation. Best Materials provides Low Pressure Spray High-Density Polyurethane Foam Insulation Kits from Versi-Foam and DOW. These easy-to-use polyurethane spray foam kits have everything needed to apply spray foam. These are the highest R-value in industry and are ideal for many applications including foam roof repairs, attic insulation, wall insulation, ceiling insulation, cold storage insulation, creation of stage props and floats, modeling, spa insulation, mobile home wall insulation, marine float & floatation repair and more. Kits with easy to follow instructions are available in sizes to fit your exact job requirement. Email or call us if you don't find what you're looking for! Flame Retardant Systems: VERSI-FOAM® is available in a system that contains additional flame retardants. This formula is classified as Class I in accordance with ASTM E-84 with a 25 Flame Spread and a 300 Smoke Developed Rating at 2". This means that the foam is flame resistant, it is not fire proof. These systems are suitable for use in inhabited buildings, including residential applications or any applications in which flammability is a concern. The density of the foam is 1.75 PCF. Foam For Building Insulation: Closed cell Polyurethane spray foam is an outstanding insulating product. We recommend Versi-Foam 1.75 PCF foam. Other foam systems may be cheaper, but do not provide this R-value. Versi-Foam 1.75 PCF foam has the highest available R value (R=7.7, k= 0.13). The 2.75 PCF foam adds structural rigidity, but no further increase in R value. Lower density foams begins to give up R-value. R-Value are for 1" layer thickness and represent initial values. After aging or excess moisture exposure, R value will decline some. 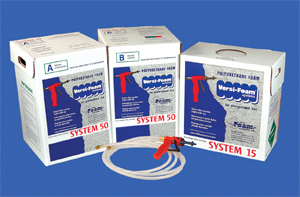 The System 50 provides the most economical solution for 1.75 PCF foam. For interior insulation, System 31 and 100 are popular. They have an open cell foam structure. 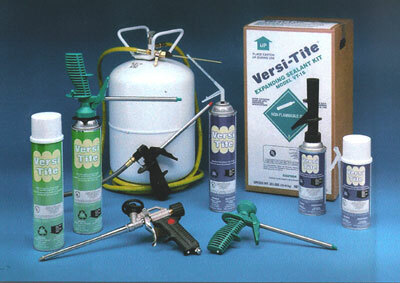 Versi-Tite is a one-component polyurethane foam used to 100% fill & seal gaps and crevices. Its most commonly used in building construction but can be used in a variety of areas. Versi-Tite is UL Classified and fire rated with flame retardant. It dispenses from the can in about a 3/8" caulking bead (with about 200% expansion) for easy use in sealing around doors, windows, pipes, outlets or any other penetrations. It's minimal expansion of two times its original volume allows for use around doors and window frames without distortion. Its a moisture curing system using humidity to dry. The product is not long-term UV resistant and should not be sun exposed over time. The foam has a R factor of 4 to 5 per inch. Its has a flame retardant system, with an ASTM-84 Flame Spread of 25 and a Smoke Developed of 50. Its available in 12 oz, 24 oz and 16 lb cylinders. The 12 oz. can will yield approximately 730 linear feet of a 3/8" caulking bead and the 24 oz. can approximately 1460 linear feet. Products Brochure and More Info. VT12F: Straw dispenser can, 14 ounce, UL rated foam. VT16F: 16 lb. tank UL foam with 9.5' hose and dispensing wand. VT24GF: Gun dispenser can, 24 ounce UL rated foam. VT24SF: Straw dispenser can, 24 ounce UL rated foam. #G10CC, Standard Gun/Hose Assembly, 10 feet. #G15C, Standard Gun/Hose Assembly, 15 feet. #G30C, Standard Gun/Hose Assembly, 30 feet. #SYSTEM-FAN-TIP, Fan Spray Tip (Used with any Nozzle). The 1.75 PCF foam, in Systems 1, 15 and 50, is 1.75 pounds per cubic foot with a free rise or 2 pounds per cubic foot in place. The foam will expand six times its original volume and is tack free in 30 to 45 seconds. The foam is >97% closed cell, has an R-value of 7.7 per inch (k-0.13), a low moisture absorption rate, -250F to +250F temperature tolerance, 22 psi compressive strength, and is suitable for most applications. It uses low-pressure spray. The high density 2.75 PCF Systems 10 and 33 have a free rise density of 2.8 pounds per cubic foot, 3 pounds per cubic foot in place. It is >98% closed cell resulting in an R-factor of 7.7 per inch (k=0.13), a low moisture absorption rate ,-250F to +250F temperature tolerance, and outstanding excellent compressive strength (26 psi). It is used where the area may be subject to foot traffic, or where enhanced structural integrity is needed. It uses low-pressure spray. The 1.75 PCF flame retardant foam has a lower R-Value (7.0 vs 7.7) and lower compressive strength (13.8 psi vs 22 psi). The foam is >95% closed cell content. This formula is classified as Class I in accordance with ASTM E-84 with a 25 Flame Spread and a 300 Smoke Developed Rating. This means that the foam is flame resistant, it is not fire proof. These spray foam insulation systems are suitable for use in inhabited buildings, including residential applications or any applications in which flammability is a concern. It uses low-pressure spray. The 1.00 PCF foam in System 28 and 88 is 1.1 pounds per cubic foot free rise. The foam is >75% closed cell, has an R-value of 6.0 per inch, moisture absorption of up to .055 lb/sqft, 8.74 PSI compressive strength. It is recommended for air sealing, filling cavities, and such. It should not be used where water or high moisture is present. It uses low-pressure spray. These are not suitable for roof tops. The low-density (0.75 lb/cu.ft.) open cell foam products like (Versi-Foam Systems 31 and 100) offer high a expansion rate, making them less expensive per board foot than closed cell foams. These systems offer a cost effective means to insulate, control air movement and reduce sound transmission between rooms within the building. These should not be used on roof tops. Fan Spray Tips. For applications in which a fanned spray is desired, an optional accessory is available to achieve this pattern. The accessory consists of two parts, and mixing nozzle with a threaded end, and a fan spray tip that screws onto the threaded end. This accessory will work with all VERSI-FOAM® Systems. The high density foam formulas in the VERSI-FOAM® System 10 and System 33 include the extended mixing nozzle as a standard part of the kit. For high density foam, the fan tip greatly improves the spray pattern ensuring a surface texture that you will be pleased with. Multipurpose Mixing Nozzles All VERSI-FOAM® Systems (other than System 1) include ten mixing nozzles. These nozzles snap into the front of the gun, and it is the only place in the system where the two chemicals are mixed together and they actually become foam. System 1 Replacement Nozzles All VERSI-FOAM® Systems (other than System I) include a gun/hose assembly and a packet containing ten mixing nozzles. In the event that the kit was not functioning properly due to too long of time between uses or extreme humidity causing a clog on the "A" component side of the gun, replacement gun and hose assemblies are available for purchase. All mediums size kits use the 10 foot gun/hose assembly complete with a packet of ten mixing nozzles, part number G10C. All large size kits use the 15 foot gun/hose assembly complete with a packet of ten mixing nozzles, part number G15C. 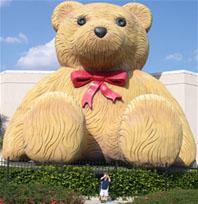 In addition, a 30 foot gun and hose assembly is available and can ONLY be used with the large size kits. Please be aware that the systems are pressurized with sufficient nitrogen to evacuate tanks using the length of hose that is standard equipment (as listed above). Using longer hoses may result in insufficient pressure to completely evacuate the tanks. Tile Adhesive (foam polyurethane adhesive in a can, Can be used for many applications.